Write a C program to input binary number from user and convert binary number to decimal number system. How to convert from binary number system to decimal number system in C programming. Logic to convert binary to decimal number system in C programming. Binary number system is a base 2 number system. Binary number system uses only 2 symbols to represent all its numbers i.e. 0 and 1. Step by step descriptive logic to convert binary to decimal number system. Input binary number from user. Store it in a variable say binary. Find last digit from binary by performing modulo division. Which is lastDigit = binary % 10. If lastDigit is 1. Then add power of 2 to the decimal result. 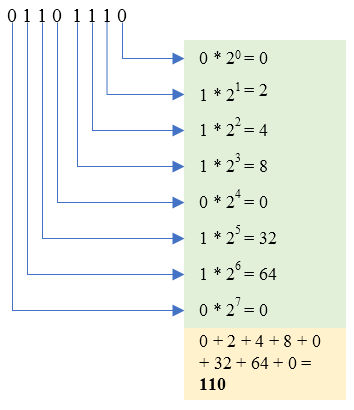 Which is decimal += pow(2, N), where N is the position from right. In the above program I have used pow() function. pow() function is used to find power of a number. Note: The above program will convert only up to 18 binary bits and will also not check for negative binary value. You can use below approach to check for negative value and also to convert binary number (greater than 18 bits) to decimal number. * Gets the 2's complement of the binary value. Loop programming exercises and solutions in C.
C program to convert Binary to Octal number system. C program to convert Binary to Hexadecimal number system. C program to convert Octal to Decimal number system. C program to convert Hexadecimal to Decimal number system.